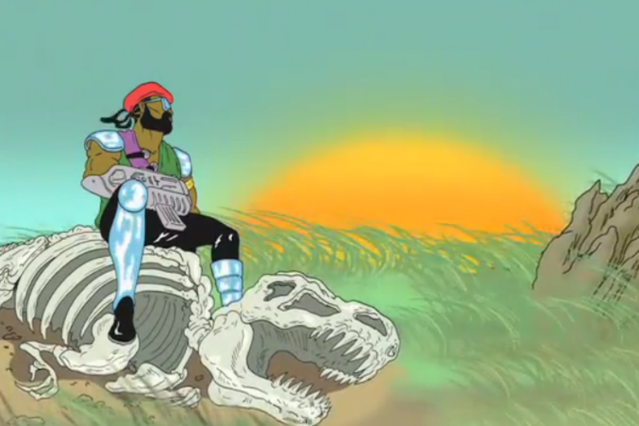 Major Lazer and Dirty Projectors are both projects with feet in the American indie-rock circuit and heads in the global cloud. “Get Free,” the latest single by the duo of DJ/producers Diplo and Switch, features DPs member Amber Coffman on vocals, and it’s a perfect meeting. The track finds Major Lazer in unexpectedly contemplative mode, with dreamy keyboard chords that bring to mind the gentler Gorillaz tracks, while Coffman alternately coos and howls with equal poise about a (metaphorical?) flood. The loping rhythm, intricate guitar lines, and burping synths suggest a meeting point between Jamaica, West Africa, and Brooklyn, though the melancholy lyrics might call New Orleans to mind. Watch a psychedelia-infused animated lyric video for the song below, or go here to download it (plus a remix by Brazilian Diplo cohorts Bonde do Role) for the price of an e-mail address.